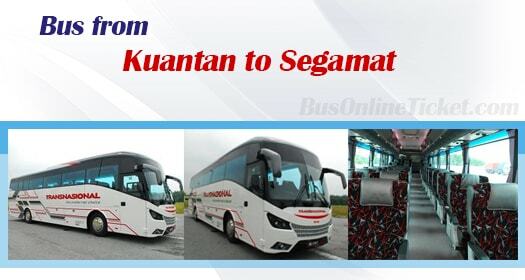 Bus from Kuantan to Segamat remains as the most convenient transportation option to connect people between the two cities. This bus service is mainly to serve the locals travelling between the two cities for study, working and visiting relatives. The coach goes via route 12, passing by Muadzam Shah before terminating in Segamat Bus Terminal. Transnasional is the only bus operators supplying bus from Kuantan to Segamat. Transnasional is the largest and well-known bus operator in Malaysia in providing excellent service and secured bus ride for their passengers. The schedule of bus from Kuantan to Segamat is limited. The bus service is only available at 8:00am, 1:30pm and 6:00pm. Duration for bus from Kuantan to Segamat takes approximately 3.5 hours, depending on the traffic conditions on the travelling day. Transnasional is operating the bus service with VIP coach to ensure passengers have a comfortable 3.5 hours journey. The bus fare from Kuantan to Segamat is from RM 14.90 for adult and RM 11.20 for child. Washroom break will be given upon request from the driver during the journey. All the buses will depart from Kuantan Sentral Bus Terminal located at Indera Mahkota. The drop off point is at Segamat Bus Terminal. Please note that Segamat Bus Terminal is located at the town centre and diagonally opposite to Segamat Train Station. Passengers are advised to book bus ticket online with BusOnlineTicket.com especially during festival and peak season. We accept credit card, internet banking, PayPal, Alipay and many more options for easy payment. Passengers will receive an instant confirmation of booking upon a successful payment.